« Can Unpaid Taxes Affect My Credit Score? Having trouble viewing our 2015 IRS Tax Refund Schedule? We do offer a printable version, view here. This is the schedule for 2015 IRS Refund Cycle Chart. Direct Deposit and Check date’s below. Please see disclaimer. 2015 tax refund schedule is listed below for information purposes. Find out when you’re state income tax refund will be in. January 20th, 2015 is the first day of tax season 2015. Show your support by liking and sharing Refund Schedule on Facebook. When should I get my IRS Tax Refund in 2015? The I.R.S will begin accepting tax returns January 20th, 2015. The IRS begin accepting some 2014 tax returns for test purposes starting January 12th, 2015. For those who have asked, 2014 Tax Refunds Will Not Be Delayed Until October 2015. Get the “Where’s my refund?” app on Android & Apple IPhone/IPad/IPod App. 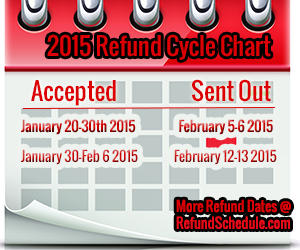 Our 2015 IRS Refund Cycle Chart Below. Get the IRS Refund Schedule. when does 2015 tax season start? When should I get my Tax Refund? There hasn’t been an official IRS Refund Schedule since 2011 Tax Season. We started in 2012 creating a similar IRS Refund Schedule for our viewers. We have continued each year to create a reliable updated IRS Refund Schedule. Each year we have dealt with changes by the IRS, but we continue to keep the most updated Refund Schedule on the web. We keep up with the IRS and tax laws passed through the house and congress to give everyone a reliable tax schedule. We use prior year dates, IRS news, and our viewer input to put together the IRS Refund Schedule. We always welcome input on the schedule and feel free to comment below if you find any problems with our tax schedule. We use the term IRS Refund Schedule to represent the federal government tax refund versus your state refund. We are not attempting to pretend to be the IRS. We are in no relation to the federal government. We are a private entity owned by an individual. This entry was posted in Finance and tagged Refund Schedule. Bookmark the permalink. Both comments and trackbacks are currently closed.